Athens, Greece – Greek foreign minister, Nikos Kotzias, has resigned a day after he clashed publicly with the country’s defence minister. 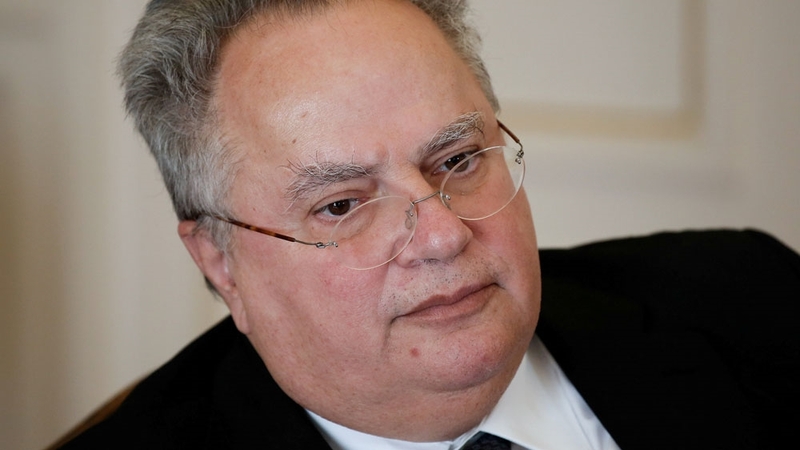 Kotzias, who served two terms as the foreign minister since first being appointed in January 2015, submitted his resignation on Wednesday and Prime Minister Alexis Tsipras accepted it shortly after. During a cabinet meeting on Tuesday, Kotzias and defence minister Panos Kammenos, leader of the right-wing junior coalition partner, the Independent Greeks (ANEL), clashed over several issues. At that meeting, Kammenos lashed out at Kotzias over the Macedonia name accord signed on Lake Prespa in June, sources told the Greek daily Kathimerini. The sources also said that the defence minister accused the Kotzias of mismanaging funds and being affiliated with Hungarian-American billionaire and philanthropist George Soros, the daily reported. Kotzias’ resignation comes amid growing instability in Greece’s governing coalition, much of it stemming from the historic name agreement signed on June 17. The state-run media outlet ANA-MPA reported that Tsipras will “take over the leadership of the foreign ministry in order to assist in the successful conclusion of the Prespes Agreement with all his power”. Tspiras went on to insist that his government will “never” accept Skopje’s ascension to the European Union or NATO “under the constitutional name the Republic of Macedonia”. In 1991, Skopje broke away from the Socialist Federal Republic of Yugoslavia. With the newly-born country deeming itself the Republic of Macedonia, it soon found itself at loggerheads with Athens. The dispute enabled Greece, which accused the former Yugoslav country of attempting to appropriate its history and harbouring territorial designs, to block Macedonia’s ascension into the European Union and NATO for decades. In 1993, Greece’s northern neighbour was admitted into the United Nations as the Former Yugoslav Republic of Macedonia (FYROM), but today more than 140 countries refer to it simply as Macedonia. After a renewed drive to resolve the dispute, Kotzias and his Macedonian counterpart, Nikola Dimitrov, signed an accord that allowed for the country to change its name to “Republic of Northern Macedonia” in June. But on September 30 a referendum in Macedonia, which allowed voters to voice their position on changing the country’s name, casted doubt on the future of the agreement. Opposition parties had called for a boycott, and the referendum’s passing was marred by low voter turnout. On Monday, the Macedonian parliament launched a debate over the constitutional changes required in order to implement the change. In late January, during a 300,000-person protest against the negotiations, a group of black-masked demonstrators set ablaze a pair of squatted social centres in Thessaloniki and vandalised the city’s Holocaust memorial. Some analysts have argued that anger over the name agreement has provided Greece’s previously embattled far right with an opportunity to catapult itself into the mainstream political conversation. “My sense is that [the agreement] is likely to go through,” Seraphim Seferiades, a politics professor at the Panteion University, told Al Jazeera.